Summer is arguably the best season to get into the rhythm of arts and crafts and start exploring your love for the hobby. There are so many ways you can spruce up your home for the summer season, so you'll have endless opportunities to create, craft, and improve. Here are eleven fun and useful items you can craft from tulle fabric. For the princess in the family, and particularly for her upcoming birthday or special event this summer, you can craft a sparkly tulle tutu without the necessity of sewing. This easy craft begins with some simple measuring of your daughter's hips where the tutu will sit. Pick your fabrics, like sparkly pink tulle and matching pink ribbon. The ribbon becomes the waistline of the tutu, and the tulle can be cut in strips and tied around the ribbon to create a full, pretty pink tutu. In addition to the princess tutu, you can make the outfit complete by adding a matching tulle crown or tiara. All you'll need to complete this craft is the tulle fabric of your choice and some craft wire. First, bend the craft wire into a loop to rest around the top of the head, and begin tying the tulle in fluffy puffs around the wire's circumference. Once you’re done this step, you can add beads and ribbon to finish it off perfectly. Using the same method, you can create a warm welcoming piece for your front door. Create a loop using the craft wire, wrap it with a type of tulle of your choice and color, and make the finishing touch by hanging the wreath with a piece of colored ribbon on your front door. For your upcoming summer event, like a wedding, birthday party, or anniversary, you can complete the look of the venue by adding tulle pom-pom centerpieces to the tables. This easy and quick craft requires tulle ribbon, and high-quality tulle of the style and color of your choice. Wrap the tulle around a thin book 25 to 50 times, depending on the size of pom you want to create, and slip off the gathered loop, tying it tightly in the center. Trip the ends of each side, and allow the loops to fall away so the free ends of the tulle create a beautiful pom! Poms can be added to wands atop glass or metal jars to create the perfect centerpiece. Perhaps in combination with the tulle pom centerpieces, hanging tulle poms create the perfect atmosphere for your upcoming summer event, too. Create tulle poms of varying sizes, both large and small, and add a long ribbon tied to the center of the pom. You can hang them in varying lengths above the table or throughout the room where the party is about to happen, creating the perfect summer party-time atmosphere. Combine lengths of tulle with ribbon or straw to make decorative garland bows for the chairs at your event. You can use anything from polka dot to animal-patterned tulle, or opt for simple, pastel colors. Tulle can be a great decorative option for the stationery objects in your home too, like a decorative lampshade. It's easy to find simple, single-toned lampshades at any home décor store, and you can easily dress them up with tulle up for a feminine and warm vibe. Perfect for a little girl's bedroom, the tutu lampshade is lined on the top and bottom by fluffy pink tulle, and is often decorated with pretty roses. Try using lace or polka dot tulle fabric for an extra special shade. You can use a hot glue gun to secure the tulle to the shade, and tie with matching ribbon. The same approach as the tutu-lined lampshade can be taken to decorate the window of a bedroom. Tulle can create beautiful tutu curtains if you simply loop lengths of tulle around the curtain rod and allow it to hang at the sides of the window. Pink or purple tulle works well in combination with wide shades or blinds, and additional flower or glitter decorations can be added to the center or corners of the gathering points at the window's topside. Something functional for your child's bedroom can also be made from tulle, which will allow them to keep all of their stuffed animals in one place. Make your tulle stuffed-animal hammock with two to three layers of tulle fabric gathered at each end and secure to a wall in your child's bedroom. Using the translucent, netted material of tulle fabric, you can also easily create your own wall art for your home. When you place tulle against the background of a plain white canvas, you'll be surprised at the charming wall art you can create. Opt for light-colored tulle, like light blue, teal, and purple, and combine colors and create geometric shapes by wrapping them around a blank canvas. If you're someone who likes to keep flowers in your home throughout the spring and summer, you'll surely be able to enhance the look of your home by adding tulle to your vase. Whether you opt for lilies in a large, tall vase, or prefer your tea roses cut short in a small vase, you can add flair to your arrangement by simply tying the tulle of your choice around the top of the vase. You can also wrap a tall glass vase in sheer lengths of tulle, or tie multiple strips of different colored tulle around the base of a cylinder vase to create an artistic flare. 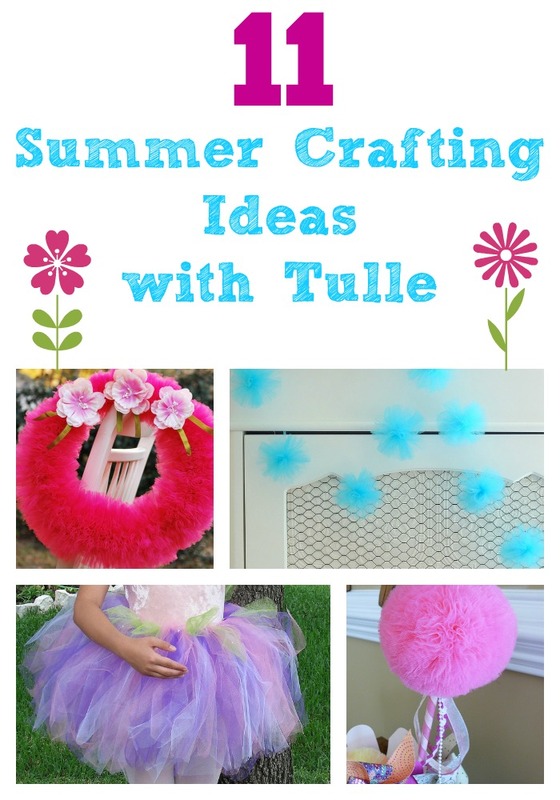 Tulle is a great fabric to explore some of the best arts and crafts for your summer season. Easy to use and work with, and available in so many different colors, patterns, and styles, tulle is easy to fall in love with once you start crafting with it. Get into your creativity and harness your summer spirit—start crafting with tulle! My daughter would totally be into the Stuffed Animal Hammock! So So cute!! I love that it is affordable too, so it makes using it in crafts even better! I love the pom poms! Such very cute ideas, crafts are a fun way to bond with your children too. Great ideas! I've never been a big fan of sewing tulle so I like the fact that not all of them need to be sewn. These are some great ideas. I like the tulle wreath. I would love to make my girls a personalized tutu featuring their favorite colors. I'm sure my oldest would choose black, while my younger daughter would like a pink and purple tulle mix! Love the little tutu, totally adorable. Thanks for sharing all these cute crafts. Great ideas! I can't wait to share these with my mommy friends.